Asthma in the elderly is not a rare disorder, but it is underdiagnosed because of atypical presentation and comorbidity. Up to 8% of subjects > 65 years old enrolled in the Cardiovascular Health Study had a diagnosis of definite or probable asthma, and a 7% prevalence of airways obstruction and symptoms suggestive of asthma has been reported in the Netherlands in an adult population. In elderly populations, asthma is an heterogeneous condition encompassing early and late onset forms. This can make the differential diagnosis between asthma and COPD difficult’: history of allergy is common in early onset, but not in late onset asthma, and several elderly patients with asthma have a persistent degree of airflow obstruction even when optimally treated. All this affects the quality of statistics on asthma prevalence and asthma-related death in the elderly. Factors associated with death from asthma, such as reversibility in FEV1, eosinophilia, comorbidity, and smoking, have been identified in subjects aged < 60 years. In this age range, death from all causes is higher in asthmatics than in nonasthmatics. 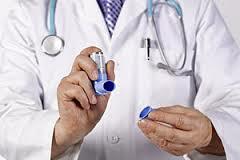 However, there is a distinct lack of information on the effect of asthma on survival of the elderly. Bauer et al failed to recognize difference in survival between asthmatics and control subjects, but they followed up only 98 asthmatics for 1 year. Furthermore, they selected a sample poorly representative of the elderly asthmatic population by excluding patients with early onset asthma (ie, those with asthma developing before age 65 years). Dantzer et al found that elderly with self-reported asthma are at higher risk of dying than the general population, but they did not identify mortality risk factors. In this study, however, smokers with history of chronic productive cough could be considered as having asthma, and therefore the sample likely included a substantial portion of patients with COPD. The objective of this study was to verify whether asthma, in a population of community-dwelling elderly people, and identified on the basis of clinical and respiratory function data, carries an excess risk of death, and to identify the characteristics associated with death in asthmatics.